Iaroslava Netchaeva (left) and Iouri Tchesnitchenko (right) are shown sporting the medals their students have won. In the late 1990s, a figure skating coach emerged from a rink in Detroit, Michigan, and began to build a dynasty that would put United States Ice Dance on the international radar. Igor Shpilband’s name has appeared next to fourteen of the last seventeen United States senior national champions in ice dance, but another coaching team out of the state of Michigan should provide for some interesting competitions at the US Nationals in the coming years. After having success on the junior international circuit, earning a silver medal at the World Junior Championships in Hull, Canada, in 1992, Netchaeva and Tchesnitchenko made the Russian National Team that competed at the European Championships in 1994 where they finished 13th. 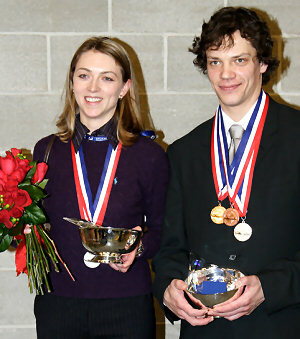 Along the way, the duo studied with some of the most prolific coaches in recent skating history including Natalia Linichuk and Natalia Dubova. The team also trained alongside Olympic Champions Oksana Grischuk and Evgeny Platov as well as Marina Klimova and Sergei Ponomarenko. After they closed the book on their eligible skating careers, Netchaeva and Tchesnitchenko opened a new chapter in their lives as professional skaters, and began touring with Jayne Torvill and Christopher Dean in the 1984 Olympic Champions’ show Torvill and Dean’s Ice Adventures. Outside of skating, the 34-year-old Netchaeva enjoys spending her free time with her fiancé and their Rhodesian Ridgeback dogs, while Tchesnitchenko, also 34, enjoys snowboarding in the winter, SCUBA diving in the summer, and his latest hobby – his pet fish.